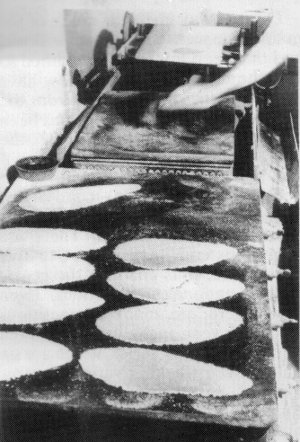 Back in 2005 I made a blog post about my hunt for Lancashire Oatcakes in the style I remember from my childhood. The closest I was able to get was a recipe for Staffordshire Oatcakes. I tried that recipe, but it wasn't right. I tried modifications, but failed. My family began to tease me about my various efforts and failures. Well, fast-forward to 2013 and the content of the Internet has greatly expanded. While Lancashire oatcakes are mentioned, there is no recipe. However, it does say they are: “...made without wheat flour or milk, and shaped as an approximate 11-by-6-inch (28 cm × 15 cm) oval, smooth on one side and rough on the other…” The physical description is exactly as I remember. The lack of wheat flour and milk clearly makes a big difference and explains why the Staffordshire oatcake recipes were not what I was looking for. On the plus side, the fact that there is no wheat is ideal as some members of my family need to avoid wheat gluten. But where to find a recipe for the Lancashire style? Combine the oatmeal, yeast, sugar, salt and oil in a large bowl. Form a well in the centre and add just over half the water. Stir to combine then keep adding water until you have a pancake-like batter. Heat and lightly oil a frying pan then add 1 cup of the batter and cook for about 4 minutes per side. Set aside to cool as you finish cooking the remaining batter. Either use immediately or dry to make 'hard'. These oatcakes will keep in the refrigerator for several days and freeze well. I have found the same recipe on Celtnet and Lancashire Life. I usually make a half-sized batch. The results have been quite good, but not perfect yet. In particular the appearance is wrong. Details of preparation seem to make a big difference. The oatmeal needs to be ground very fine – the finer the better I have found. I use a kitchen machine on a high grind setting for a minute or so. The recipe calls for yeast, but there is no mention of letting it sit first. Most recently I did so for two hours at room temperature, which seemed beneficial. Overnight in a refrigerator might be even better. I will have to experiment. Then there is temperature. At first I tried cooking as I would a traditional crepe, but the oatcake never seemed to brown properly. I realized that crepes are cooked at a comparatively low temperature because of the milk and eggs in them – both of which burn easily. I had much greater success with a higher temperature; if fact, a very high temperature. An important distinction of Lancashire oatcakes is that they are smooth on one side, and bubbly on the other. Reference is made to using a cast iron griddle or hot stone, not a modern non-stick frying pan of course. Significant mass to resist cooling as the batter is added should help. 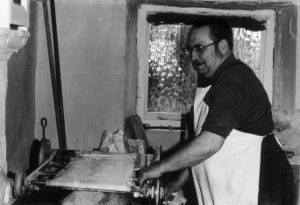 A key element was an ‘oatcake throwing machine,’ patented in the 19th century. It is this device that creates the characteristic elongated shape, and which deals with the tricky issue of spreading the batter in a thin and uniform layer before it is placed on a very hot, hotplate with a shellac surface (to prevent sticking). After the first side is cooked (the side that is smooth), “The oatcake is scraped off the face with a flexible knife about 40cm long by 5cm wide picked up by hand and transferred to the second hotplate.” This second plate is cooler, and the oatcakes appear to be left on it longer as there are 8-10 on it while there is only one on the first plate at any time. Reference to the large flexible knife or spatula solves another issue I found. The oatcakes are very fragile while they are cooking. Much more so than pancakes and crepes made with wheat – gluten helps bind them. So I have some more experimenting to do, but I think I’m on the right track. The good news is that my family likes the recent results well enough to eat them now. Yesterday, in the As the pendulum swings - Users vs. the Enterprise, I discussed how the balance between the needs of staff users and those of the enterprise that employs them has recently swung strongly to favor users as a result of consumerization. My perspective was that of the enterprise. But even though users are currently in an advantageous position, they may still encounter issues. I found this when I left OpenText recently. I had worked for over a decade in the same company. Outlook/Exchange was the standard email system during that whole period, and in recent years OpenText's own Exchange email archiving solution was implemented internally. I was comfortable that here was robust data protection, backup and archiving with long-term recovery capabilities that I could rely on without thinking. I kept all of my contacts in the system, and was readily able to access them through my laptop, Blackberry and iPad. When I left the company, my access to the Exchange server was of course removed. That is when I discovered that I had lost all of my contacts, some ~4,000 in number. In hindsight it was obvious that I had become complacent and was not using the features of Outlook that would have stored my personal information locally. Fortunately, I was able to recover the contact vCards. All would not have been lost, as I use Linkedin for many contacts, but certainly not all. But, I also connected my primary ISP email account (Yahoo) to Outlook so I could read both work and personal emails. Fortunately, I had configured the mail service to keep copies even after they were downloaded by Outlook, so I still had copies of the incoming emails, though not some of the outbound. There were a few other emails accounts that I use less often and did not bother to connect so these were unaffected. I had kept my personal files separate from my work files on my company-supplied laptop, and my departure from the company occurred over time, so I was able to ensure I had preserved all of these on my personal computer. But had I been required to immediately return all of the company equipment, getting my personal files off the company equipment would have been hard or even impossible. So, lesson learned. As I reconfigure my personal 'IT World', I will make it more robust and independent. It will have a redundant blend of local and Cloud storage. I learned that lesson with the dot.com bust when a number of resources I used disappeared without warning. In fact recently, both the Adjix and Unhub sites that I used regularly disappeared. But I will also ensure that I can respect the compliance and efficiency needs of any company that I work with in the future. The merger of personal and social in the information sphere in recent years has been much discussed. But it isn't just enterprises that have to deal with this, so must their staff. 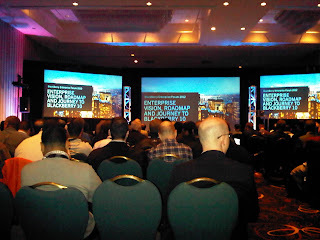 Today was my first day after I left OpenText. I had a great 11 years with the company that afforded me fabulous opportunities to learn about content management, the enterprise content management (ECM) field and how it relates to business process and enterprise architecture. In recent years our view of content greatly expanded to the digital media perspective. On the collaboration side, I had many opportunities to blog - sometimes in this blog, and more often in OpenText Online Communities and internally within OpenText. I also heavily promoted microblogging in the context of work. After a slow start, it was gratifying to see growing numbers of active participants. Personally I am one of those who tend to 'drink from a firehose' of information, even when it threatens to give me a headache. As a believer in the importance of metrics, it was interesting in my studies to find I was subscribed to 40% more internal discussions than the next most active staff member. I was also one of the most active and relevant staff on external social media as shown by internal tracking studies for marketing effectiveness. So my activities had business benefit. But they also had personal benefit. Much has been written about the merger of personal and business life, and this is one clear example. As I announced my departure from OpenText, I was contacted privately and publicly through many different channels, which was very gratifying. New opportunities are opening up, in part because of those online social activities. I'm hoping for a wide range of new experiences in the coming months, helping me to broaden my knowledge and to do some things I could not do before. The orientation of this blog will change, and hopefully my post frequency will pick up again. Meanwhile, if you'd like to contact me directly you can find me on Linkedin, Twitter (@MartinSS) or email me at MartinSS at Rogers dotcom.